In Austria, where the campaign is running since 2003, there there are over 20,000 children in about 200 schools collecting "Klimameilen"yet. Many of them collect Footprints during 4 weeks. And lots of them even during summer holidays! The primary school Kilb ist he summer winner of “Klimameilen” in 2014. During the action period of 5 days 114 children of primary school Kilb collected 1,180 green footprints altogether. For this reason, for the first time, the school from Lower Austria ensured victory at half-time. Just like the municipality Gemeinde Kilb , VS Kilb has been member of Climate Alliance for three years. As reward for the busy collecting of green footprints, there was a visit to the zoo of Schoenbrunn. Of course, a climate friendly ÖBB postbus was used for the journey. For two weeks, children have been going as many ways to school as possible environmentally friendly by foot, by scooter or by bike. 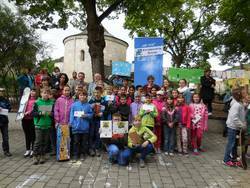 Putting all together, 4,919 Green Footprints were collected, which were handed over symbolically to Mayor Josef Zeitelhofer as a poster. During the next UN Climate Conference they will be presented together with all other Europe-wide collected Green Footprints. As reward, the diligent collectors entered a draw of material prizes, which were offered by the community, the association of parents and other donators. The children of the class 3b received the first price for the highest number of Green Footprints, 100 euros for the class fund, donated by the community. In addition, each class received a certificate, a ball and caps. However, this was not the only reason to celebrate: The elementary school became a member of Climate Alliance and director Christine Otto was very happy to receive the member certificate from Climate Alliance’s employee DI Christiane Barth. Furthermore, the pupils of the class 3c presented their „Mobility Song“ under the direction of their teacher Martina Hausmann. Even after the end of this campaign, many children of VS Hainburg keep going to school by foot. With that they protect the climate, promote their health and with that cultivate their friendships, too.